Our Staff will become your friends as they strive to give you excellent service both in the field and back at Camp. We have guides with nearly 70 years of combined experience, and two of our guides have been with us since our founding in 1983. Your Guide will work diligently during your Whitetail Deer hunt to help you secure many opportunities for quality animals; whether it is the Trophy of a Lifetime or meat to put in your freezer. Our ranch manager supervises all Whitetail Deer hunts, as well as the number of hunters afield on any given day. 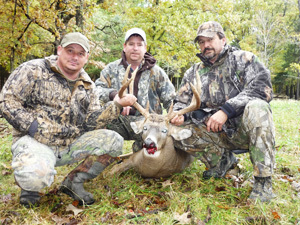 All Whitetail Deer hunts at High Adventure Ranch are done by the Spot and Stalk method. 95% of the over 5 square miles of Missouri land at High Adventure Ranch is heavily wooded with timber, thick cover, and many rolling hills. This terrain makes for a very challenging hunt on the ground! Most shots are taken within 100 yards. There is sometimes the opportunity for longer shots in some of our open fields. Our guides are all local individuals with experience hunting on this type of terrain and land. You can also bring along a hunting partner or Non-hunter to either video record or take pictures of your successful Whitetail Deer hunt. Also, if you have any special needs, we can accommodate you in the field. After the kill, step back and watch our guides take care of the field dressing, skinning, and cleaning of your animal. If you have full meat processing with your package, it will be hand cut, vacuum sealed, labeled and put in the walk in cooler until you leave. Caping is also available by your guide for an additional cost. We also have a local taxidermist available.